Pacific West is no longer a new name in the F&B industry as well as in many households throughout the Asia Pacific Region, Europe, South Africa, New Zealand and the Middle East. Since its inception in Australia in 1995, Pacific West has evolved over time to become a caring household seafood brand name which exudes friendliness and warmth. It evokes a vibrant calibration that gels well with the cosmopolitan lifestyle of the people who enjoy good food and good health. In conjunction with new improved Cheezy Fish Fillets launched, Pacific West is in collaboration with Holiday Tours & Travel Sdn. Bhd. (Penang Office) to bring you the ‘Win Your Dream Holiday’ contest from 15th November 2017 until 15th January 2018. Stand a chance to experience the riverside capital of Western Australia, Perth (4D3N for 2 pax) or the famed island of the gods, Bali (4D3N for 2 pax) by purchasing a minimum of any one (1) Pacific West product in one receipt from any of the participating outlet in Malaysia within the contest period stated above. Joining the contest is easy as you could either fill up a form available at the outlets and send via Pos Malaysia or Whatsapp to +6013-601 9224 with all the necessary details stated in the poster below. Pacific West Products can be real versatile if you just put on your thinking cap and think out-of-the-box or you could merely just fry them and enjoy with your family members and friends, especially during this coming festive seasons. Let’s me show you some simple preparations which you could use to impress your family members or guests. I’ll be using the newly formulated Cheezy Fish Fillets, natural white flaky fish fillet, topped with a mixture of premium Mozarella and Nacho cheese and coated with a crispy Japanese breadcrumbs, thus giving the product a unique aroma and taste for consumers. Malaysia’s all-time favorite Halal certified Japanese restaurant, Sushi King from nationwide, would be promoting its “Japanese Curry with a Kick” from 1 April 2017 until 30 June 2017. Sushi King is introducing an exclusive Japanese curry menu with added punchy ‘kick’ to suit the local taste buds and spicy enough to fire up any Malaysian’s savory palate. The special menu would be available for a limited time in which various authentic Japanese fare would be merged with a spicy twist and mouthwatering flavors for those adventurous foodies who love to have “spicier” moments in their lives. Do click on the poster below to enlarge for a better view. We were then served with the hot plate style Grilled Cheese Curry (RM13.90++), a heat infused version of the Chicken Katsu Curry Rice as above but with an additional piece of melted cheese. The combination was tasty, giving that extra umami flavor into the dish. Next on the list was the Agedashi Beef Curry (RM18.90). The dish came with a set of deliciously pepped up fried bean curd, pan fried beef, Shimeji mushrooms and cheese in a nicely spiced up curry base, served with a bowl of steamed Japanese rice, miso soup and chawanmushi. It was indeed a heavenly combination. However, it would be great if the kitchen would have the option for chicken for those non beef consumers. Sushi King did also introduce 4 other curry based sushi in this promotion, namely Aburi Curry Tamago (flame grilled egg with cheese and curry mayonnaise – RM3.00++), Curry Tori Katsu Gunkan (deep fried chicken with curry mayonnaise – RM4.00++), Curryfornia Roll (crabstick, cucumber, egg and flying fish roe, served with curry piri-piri sauce – RM5.00++) and Curry Ebi Fry Nigiri (deep fried prawn with curry mayonnaise – RM6.00++). I really could not decide which one out of the 4 items served were the best as each item has their unique flavors. We were also introduced to two new desserts in Sushi King, which were the Matcha Ice Cream Doughnut (RM4.90++) and Vanilla Ice Cream Doughnut (RM4.90++). Both were simply refreshing after a hefty meal of curried meals. 1. This giveaway is only valid for those residing in Malaysia only. 4. Each participant can only win ONE (1) prize. 5. Winners will be tagged on the Facebook giveaway post by 12.00pm, 23 April 2017. The most creative comments will win prizes as stated below. Overall, I’m so happy that finally Sushi King has finally introduced spicier dishes into their menu, though it’s just for a short period of time. I’m sure Malaysians, who are used to various spicy dishes in their daily meals would be pleased with the many options available. The Kiryu Udon is not something that is common in this region and Sushi King made it possible for us to try it out. It was indeed a great experience for all of us. The Sushi King @ Gurney Plaza is located at level 2 of the new wing. Just use the escalator up to level 2 and you can see the outlet on the right. Address: Lot No. Lot 170-02-58, Plaza Gurney, Persiaran Gurney, 10250 Georgetown, Penang, Malaysia. About Sushi King: Sushi Kin Sdn Bhd was established in 1995, introducing sushi on the kaiten (conveyor belt) to Malaysia through its well-known brand, Sushi King. This chain of restaurants serves quality sushi and other Japanese cuisine at affordable prices in a warm and friendly environment. What sets Sushi King apart is the personal touch of serving freshly made sushi on the kaiten for customers to pick up and enjoy. From a single outlet in Kuala Lumpur, Sushi King has expanded to 100 outlets and counting throughout the Klang Valley and even covering nearly every state across the nation, making it the largest Japanese kaiten concept chain of restaurants in Malaysia. Sushi Kin Sdn Bhd is a member of the Texchem Group of Companies, being one of over thirty-five subsidiaries under Texchem Resources Bhd (Texchem), a Malaysia-based multinational, listed on the main board of Bursa Malaysia. Texchem has four core business divisions – Restaurant Division, Industrial Division, Food Division and Polymer Engineering Division. 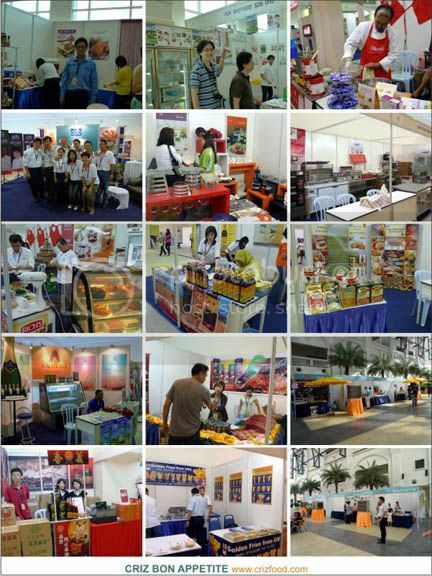 The 13th Penang International Salon Gastronomique or commonly known as the “Battle of the Chefs (BOTC)” is currently held at Straits Quay Penang from 3rd June 2011 until 5th June 2011. 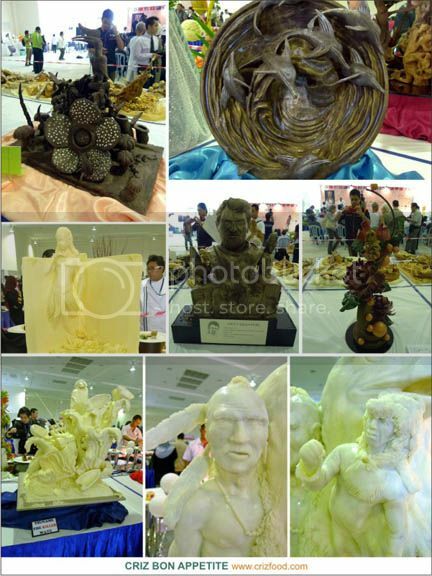 Ever since the inaugural event was held in July 1988 at the Shangri-La Hotel, Penang with only 60 chefs from major hotels in Penang, today it had attracted more than 750 participants from over 20 countries. 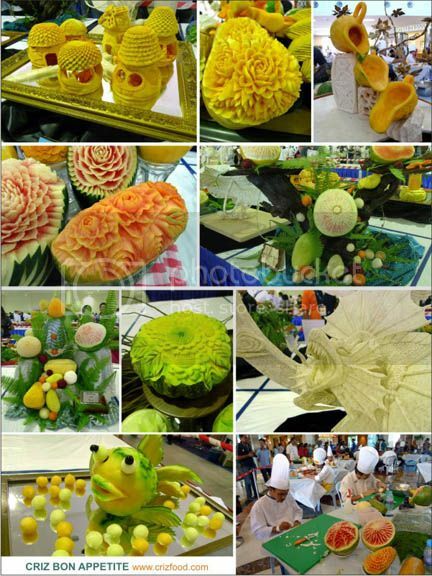 Organized by the Malaysian Association of Hotels Penang chapter (MAH) and the Chef Association of Malaysia Penang chapter, this event has seen more and more promising talents walk away with many prestigious awards. The event was officiated by Tuan Haji Abdul Malik Kassim, Penang State Executive Councillor, in charge of Domestic Trade and Consumer Affairs Committee, on behalf of the Chief Minister, YB Mr. Lim Guan Eng. The organizing of the event is led by Chef William Thong, Organizing Chairman for BOTC 2011, who is also the Executive Chef of Holiday Inn Resort Penang and Chef Marco Battistotti, Organizing Chairman for the 1st MAH Penang Chapter Hospitality Challenge 2011. 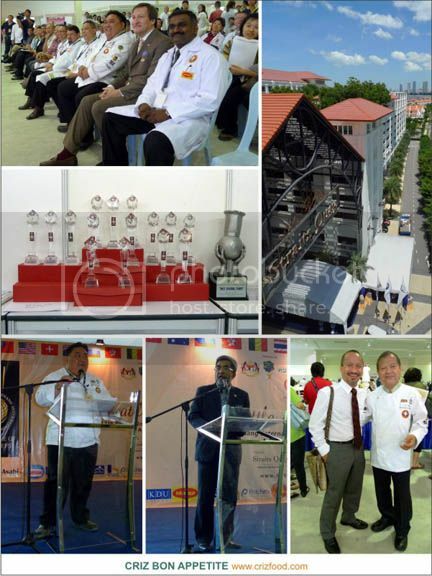 There are many awards up for grab by the hotels, associations, organizations, institutions or competitors such as the most prestigious Penang Governor’s Challenge Trophy, Nestle Overall Best Chef Award, Most Outstanding Patissier, Most Outstanding Apprentice and more. 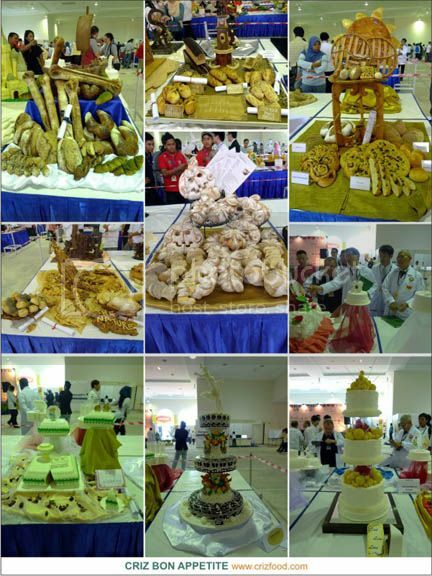 There were all together 3 sites for the competition participants to show off their culinary skills. There were over hundreds of dishes prepared on the first day and I would share with you some of those rather nicely presented ones here. As for the exhibition sections, there were many categories to be challenged. 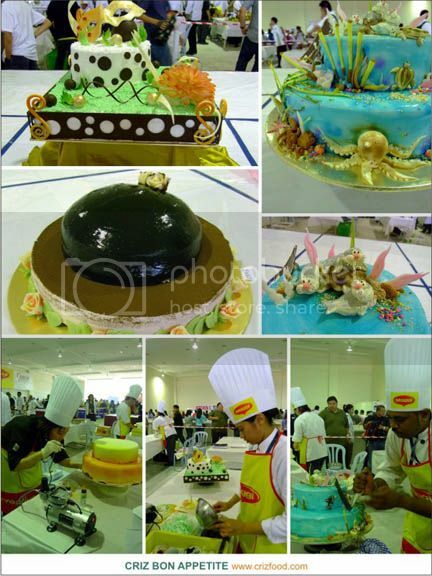 Firstly, there were sections on Bread Showpiece, Dummy Wedding Cake, Chocolate Work, Butter Sculpture, Roselle Supreme Dress The Cake (2-tier) as well as Fruit & Vegetable Carving (Theme: Fairy Tale). Let’s have a peep at those attractive ones here. 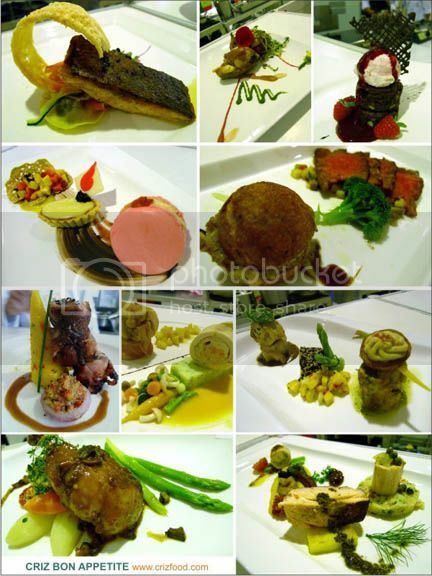 It was also a privilege to be invited by Mr. Thomas See, PR Manager/Exhibition Booth Liaison, BOTC 2011, to be one of the judges for their Modern Western Cuisine Restaurant (3 chefs, 1 waiter & 1 bartender) Competition. There were 4 tables and each table was handled by a different hotel/institution. 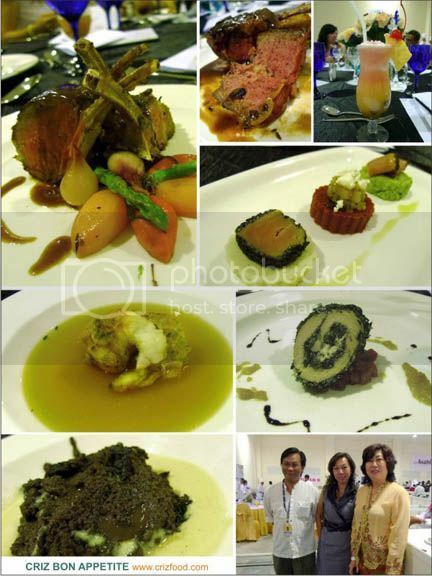 I had the opportunity to try out the Renaissance Melaka Hotel’s fine Western course dinner by judging them on presentation, taste, ingenuity and innovation. We were first served with Malacca Moon Rise, a mocktail with a concoction of orange juice, pineapple juice and grenadine, blended with ice cubes and served with cincau (herbal jelly), There was not much of a distinctive flavor here as the beverage tasted just like a normal glass of mixed fruit juice. It lacked that little touch of sourness to boost up the appetite on any meal. The starter was the Cold Medley, with Tuna on Cauliflower Mousse, Beetroot with Roasted Pumpkin Salad and Duck Broccoli Stack. This dish was rather unique as the cauliflower mousse was wonderfully prepared and the broccoli stack was just right with some mild seasoning. Unfortunately, the beetroot lacked in flavor although the combination was truly special. The Ocean Consomme was just right without the overpowering fishy taste. It had a crispy deep fried prawn with saffron with a hint of mild turmeric being used in the broth. The Chicken Roulade which had spinach and goat cheese (feta cheese) stuffed within a chicken fillet, actually blended in real well with the fruity persimmon reduction. Somehow, the chef did not provide the moist within the dish and a bit too much of herbs were used on the outer later. I wondered if they are aware that a bit of pumpkin paste added in would solve the problem of dryness. The next dish had lots of praises as the Rosemary Lamb served with garlic lemon vegetables was almost perfect if not for the slightly undercooked vegetables. The baby lamb racks had the texture, tenderness and taste just right for everyone. The Classic Chocolate Fondant with Crème Anglaise tasted great. If not for the malfunction of the oven, the chocolate fondant would be in a better shape rather than in a big clump. The crème anglaise would blend in better if it was not as concentrated as served. Overall, it was a pleasant dinner for all of us judges. Due to the problem with the Chicken Roulade, the hotel only secured a Diploma. The rest of the 3 competitors, namely Thailand Culinary Academy (Table 1), Sandy Bay Beach Resort (Table 2) and Eastin Hotel (Table 4) all secured Silver medals. There would be many stalls, scattered at the Straits Quay entrance, on the lower level as well as within the inside and outside of the conference hall for you to patronize. Some of them would be selling items while others would be given out free food samples. 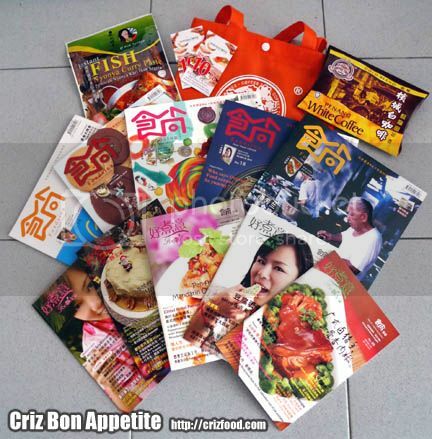 For your information, those who had not heard of Foodsion, a bilingual food and lifestyle magazine, you can now get a set of 5 recent issues, 5 mini recipe books, Heritage Coffee 10% discount cards, Raiya toothpaste, Penang White Coffee and Nyonya fish curry paste, all in a recycle bag for just RM25. Normal price is RM12 per book.